Veteran journalist and former diplomat laid out four important questions surrounding the events of how the Philippines lost the Scarborough Shoal to China, all of which link back to the three key figures in the controversy, Senator Antonio Trillanes IV, former Foreign Affairs Secretary Alberto del Rosario, and former President Benigno Aquino III. The questions Rigoberto Tiglao asks all pertain to the similar narratives the three officials gave. It had baffled Trillanes then as to why the boats were released without him knowing, and since then this version of the story has never been contested even when Tiglao ran it several times. In an article posted by Del Rosario on his “Alberto del Rosario Institute for Strategic and International Studies website, he said, “during the impasse at Scarborough Shoal with China, we were approached by the US, an honest broker, for both China and the Philippines to agree to a simultaneous withdrawal of ships from the shoal. Tiglao quoted a different source, one he claims is very credible and unbiased, that detailed another (supposedly more accurate) version of what really happened. “Based on accounts of very credible sources, Fu Ying, China’s vice minister of foreign affairs in charge of Asia (who had been ambassador here from 1998 to 2000) met June 1 in Washington with Kurt Campbell, US assistant secretary of state for East Asian and Pacific affairs, to discuss Aquino and Del Rosario’s request for the Americans to intervene — even militarily, my sources claimed — in the Scarborough Shoal stand-off. Campbell proposed the idea of a simultaneous withdrawal. Fu told Campbell that she would relay the suggestion to her superiors in Beijing. She never got the green-light from Bejing,” Tiglao wrote. 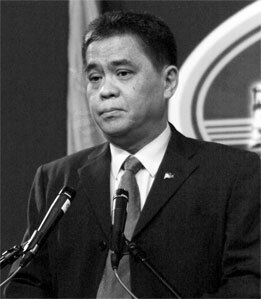 With the varying claims of Del Rosario and Trillanes, Tiglao hopes to make sense of them all when he finally gets an answer as to 1)who in the US State Department whom Del Rosario claimed brokered the agreement between Philippines and China, 2) who informed Del Rosario about the agreement, 3) was Aquino informed of the agreement before the Philippine vessels were withdrawn, and 4) who did Del Rosario give orders to to withdraw the Philippine vessels. By finding the answers to theses questions, Tiglao asserts that accountability can be achieved. Knowing who were the in-betweens and other key personalities in the controversy is important in determining who is at fault. Tiglao seeks an “objective narrative” on the event and urges Congress to pull its resources to bring out the truth. I WAS astonished at the gall, and hypocrisy, of former President Benigno Aquino 3rd, when he recently admonished President Duterte to be transparent in his dealings with China. Aquino will go down in history as the first, and hopefully the last, president to preside over the loss of territory: Bajo de Masinloc, also known as Panatag or Scarborough, Shoal, in June 2012. Yet Aquino and his official directly responsible for the loss, his foreign affairs secretary Alberto del Rosario, have not explained exactly how they lost Panatag to China. It is not just an academic exercise for the truth on this matter to be ferreted out. The details of Aquino and del Rosario’s colossal boo-boo, will enable our nation to see clearly what our foreign-policy stance should be over the South China Sea territorial dispute. In April 2012 vessels of the Philippine Coast Guard and the Bureau of Fisheries Aquatic Resources arrested Chinese fishermen in the shoal’s lagoon, alleging they were catching endangered fish. When a China Maritime Surveillance t(CMS) vessel — a civilian ship — arrived to prevent the arrest, Aquino deployed the BRP Gregorio del Pilar, the Philippine Navy’s biggest warship, which had been donated to us by the US a year earlier. Yellow media reported our ships left Panatag due to typhoon mid-June, when they actually left June 3 Trillanes alleged, upon Del Rosario’s orders. 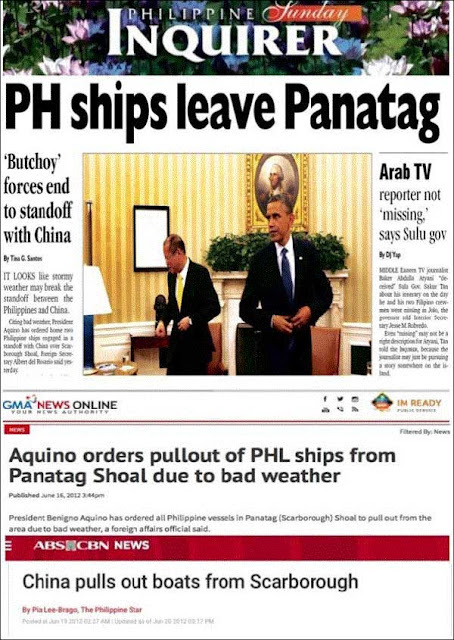 However, the very next day, Aquino ordered the warship out, informed that oops! he had just militarized the squabble. Three CMS ships with about 50 small fishermen’s dinghies enter the shoal and block the Coast Guard and BFAR vessels, which had of course released the Chinese they had arrested. For more than a month, Chinese and Filipino ships were in a stand-off, with their governments knowing that the party that withdraws from the shoal will in effect be losing it — forever as it were. The unwritten rule in territorial disputes all over the world, is that occupation –especially one undertaken not through violence — is ownership. On June 3, after a month of so-called back-channel talks by his personal envoy Sen. Antonio Trillanes 4th, and purportedly after negotiations through official channels by del Rosario and our ambassador to the US, Jose Cuisia, all the Philippine vessels were ordered out of the shoal. Since then, no Philippine vessel has been allowed to enter the lagoon: We lost Panatag Shoal. Trillanes informed me back in 2016 and in a written aide memoire of this “Back Channel Talks,” that when he was still arranging the details of the simultaneous withdrawal of both Philippine and Chinese ships, Aquino called him and told him that the Filipino ships had already sailed out of the lagoon. 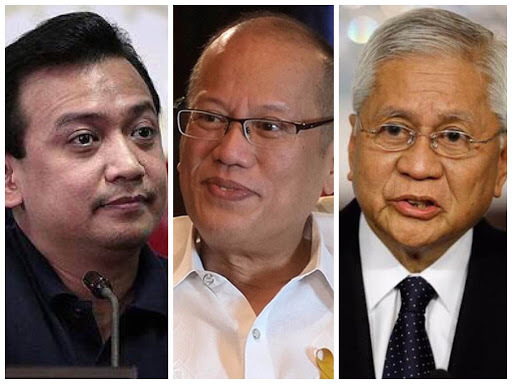 Aquino told the stupefied Trillanes that del Rosario had informed him that an agreement had already been reached with the Chinese in Washington, and that it was his foreign secretary who ordered the Filipino ships to leave. This account has not been disputed by Aquino, del Rosario, and Trillanes ever since I first wrote it in May 2016 and repeated in several articles. It is obviously a self-serving, misleading claim, intended to hide his big blunder. Consider the following points, and one could easily see through del Rosario’s lies. especially as it was the mediator — that the Asian superpower didn’t keep its word, therefore confirming the American narrative that that nation can’t be trusted and intends to occupy the entire South China Sea if not by force, by subterfuge? If the US State Department could not officially claim that there was an agreement, wouldn’t it do what it often does, which is to leak it to its media especially its usual venue The New York Times? Based on accounts of very credible sources, Fu Ying, China’s vice minister of foreign affairs in charge of Asia (who had been ambassador here from 1998 to 2000) met June 1 in Washington with Kurt Campbell, US assistant secretary of state for East Asian and Pacific affairs, to discuss Aquino and Del Rosario’s request for the Americans to intervene — even militarily, my sources claimed — in the Scarborough Shoal stand-off. Campbell proposed the idea of a simultaneous withdrawal. Fu told Campbell that she would relay the suggestion to her superiors in Beijing. She never got the green-light from Bejing. Isn’t this account more credible, given China’s system of governing, in which such crucial foreign policy decisions are decided in the highest echelons not just of government but of the Communist Party of China? 1. Who exactly in the US State Department brokered, as del Rosaio claims, the agreement between the Philippines and China? Was there a document on this very important agreement? If none, why wasn’t there one? 2. Who in the US State Department informed him about the alleged agreement? Or was it just his close friend our ambassador the US then, Jose Cuisia? Or did del Rosario — 73 years old at that time — possibly mishear what was relayed to him, that he heard only “agreement” when it was actually “proposed agreement”? 3. 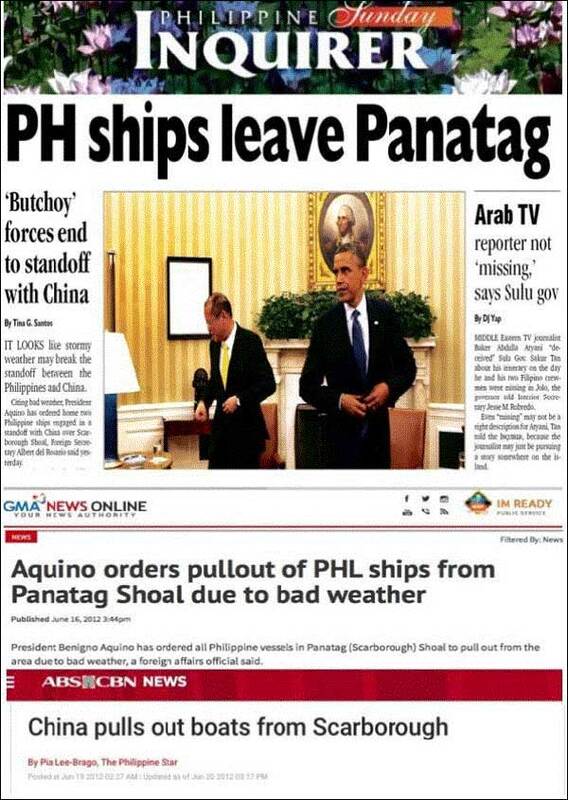 Was Aquino informed about the alleged agreement before the order to the Philippine vessels given to withdraw from Panatag Shoal? Or was Trillanes being truthful when he reported that it was del Rosario who ordered the vessels out without even getting clearance from the President. If this is the case, del Rosario is liable for usurpation of authority, similar to what could put former national police head Alan Purisima in jail, because he supervised elite troops when he was no longer in the required post of authority. 4. Who exactly did del Rosario issue order for the Philippine vessels — those of the Coast Guard and the BFAR — to withdraw from the shoal? Was it the commandant of the Philippine Coast Guard, then Rear Admiral Edmund Tan, or his boss Mar Roxas, secretary of the transport and communications department, under which the Coast Guard is? The answers to these questions are crucial for the nation to assign accountability for our first loss of Philippine territory. Del Rosario, with his enormous wealth and longtime associate, the Indonesian magnate Salim (who controls the Philippine Star-TV 5 media empire) of course has been creating a different narrative, which paints China as the villain in this episode and practically demands an antagonistic stance against the economic superpower. He apparently has even recruited academics with expertise in the South China Sea dispute into his “institute” with fat consultancy fees. Would they not toe del Rosario’s line? It is only Congress that has the resources more than what del Rosario commands , which can ferret out the truth. An objective narrative of how we lost Panatag is crucial for the country to adopt a correct foreign policy. On Friday, I will explain how the possible answers—or absence of answers—on exactly how we lost Panatag could lead to an intriguing, but likely explanation: The US played Aquino and del Rosario to lose Panatag, so a flash point could be created in the South China Sea territorial dispute to paint China as an expansionist power.